Last Days of Cinema mourns the loss of celluloid projection in the face of digital technologies. More and more movie theatres are replacing their film projectors with HD digital projectors, some of which are linked up for satellite feeds. DCP has rapidly replaced 35mm film across North America and the material object of the film print is fast becoming a rarity. In those movie theatres that do continue to project from celluloid, many of them no longer employ professional or unionized projectionists. Instead, they have computerized systems that allow the popcorn and ticket vendors operate the projectors, which saves the theatre the expense of hiring actual qualified projectionists. The photos and video footage in this installation were shot when I worked as a projectionist in a ninety year old theatre in Amsterdam. 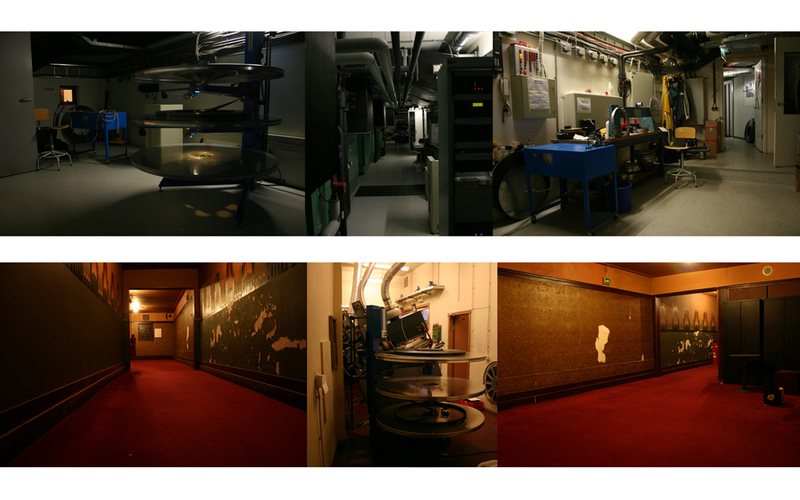 The videos document my route from projection booth to projection booth through both old and unrestored sections of the theatre as well as through fully modernized and computerized sections. Film as a celluloid material is gradually being replaced by digital technologies such as high definition video and satellite feeds directly into movie theatres. 35mm celluloid film has been the standard for commercial movie projection since 1895, and it is now in its last days as cinemas around the world are gradually replacing their projectors for HD projectors and satellite feeds. 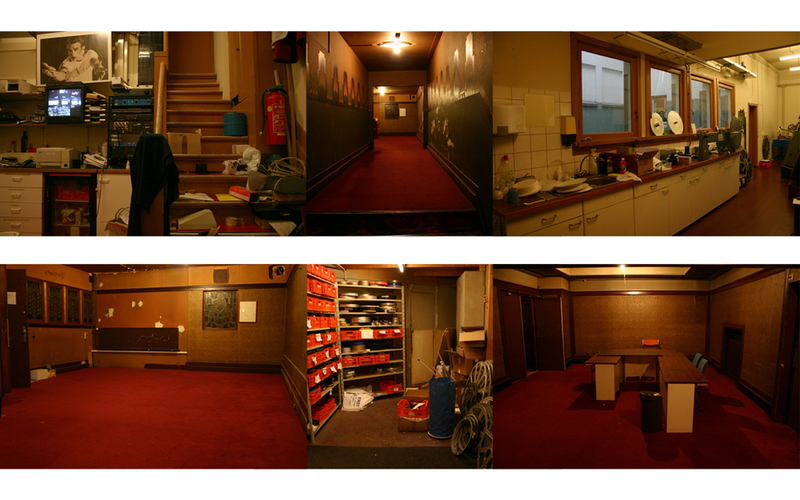 The video footage in this work was shot while I was working as a projectionist at the Tuschinsky Theatre in Amsterdam. The Tuschinsky Theatre was built in 1921, during the silent era of film, back when film was still a spectacle and going to the cinema was a special event - long before the days of DVD rentals, low resolution data projectors, and youtube videos. The Tuschinsky Theatre had five cinemas within it, as well as two bars, a kitchen, over 900 light fixtures, custom made carpets, embossed wallpapers, fountains, a VIP lounge, a bathroom designated to the royal family, and several custom themed waiting rooms. Three of the five cinemas were restored for public use in 2002, and one of those three cinemas seats 800 people including the use of two balconies that wrapped around all the way to the screen with opera boxes. As a projectionist, it was a long and winding route from projection booth to projection booth, and it involved passing through many unrestored rooms, corridors, and hallways with torn wallpaper, graffiti, cracked walls, stained carpets, and random refuse. It was evident that these spaces were once resplendent, and by now they had become nothing more than a functional (if inefficient) route from one projection booth to another, which I walked (or ran) countless times a day as I loaded and unloaded movies throughout my shift at work. The footage in this double video projection was shot one day at work as I documented my routes from booth to booth and explored some of the unrestored and locked rooms of the theatre. This footage does not show any of the restored theatres, but focuses rather on the hidden spaces not accessible to the public. A recurring image in this work is the scene from within the projection booth where the image reflects back off the sound proof glass thus casting an inverted reflection of the movie back onto the wall behind the projector. The projectionist often stands with her shadow cast within the inverted image of the movie. The projectionist is able to watch the audience watching the movie and to watch her own image as a shadow cast within the movie behind her.